Official West Virginia State Tartan. Photo by John A. Grant III (all rights reserved, used by permission). All state tartans. West Virginia State Tartan; . Photo by [file:field-file-photographer]/[file:field-file-source] ([file:field-file-license]). White to have all the colors of this great nation intertwined with the state of West Virginia. Sett Thread Count, Pivots Full: Dark Yellow 4, Forest Green 4, Muted Blue 8, Forest Green 4, Azure 6, Scarlet 24, White 2, Black 6, Scarlet 24, Forest Green 8, Scarlet 8, Muted Blue 8, Forest Green 4, Dark Yellow 4 and reverses. The quest for an official state tartan for West Virginia began at Stone Mountain, Georgia in 2005 when John A. Grant III, a native West Virginian of Scottish descent, asked his good friend Phillip D. Smith PhD, "Why doesn't West Virginia have a state tartan like so many other states?" His reply to John was, "Why don't you design one?" And so, with Dr. Smith's guidance, John began the task of composing a tartan to include symbols of his native state. 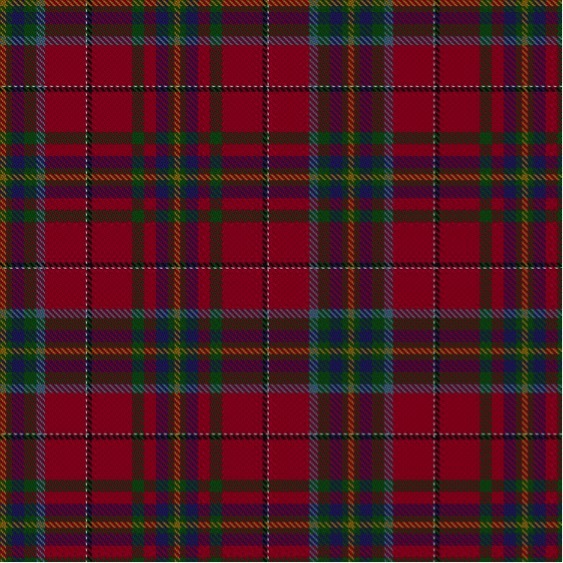 After several attempts, the West Virgina State Tartan was born. In January 2008, Kevin and Ron (John’s brothers), began a campaign with West Virginia delegates Fragale, Cann, Laquinta, and Miley to establish an official West Virginia state tartan. In February 2008, House Concurrent Resolution #29 was introduced and passed in the House and on March 6, 2008, it was passed in the Senate. On May 3, 2008, the first weave of official West Virginia tartan was unveiled by the Grant family at the Scottish Festival and Celtic Gathering in Bridgeport, West Virginia. This first weave is now housed at the West Virginia Division of Culture and History Museum in Charleston, West Virginia. 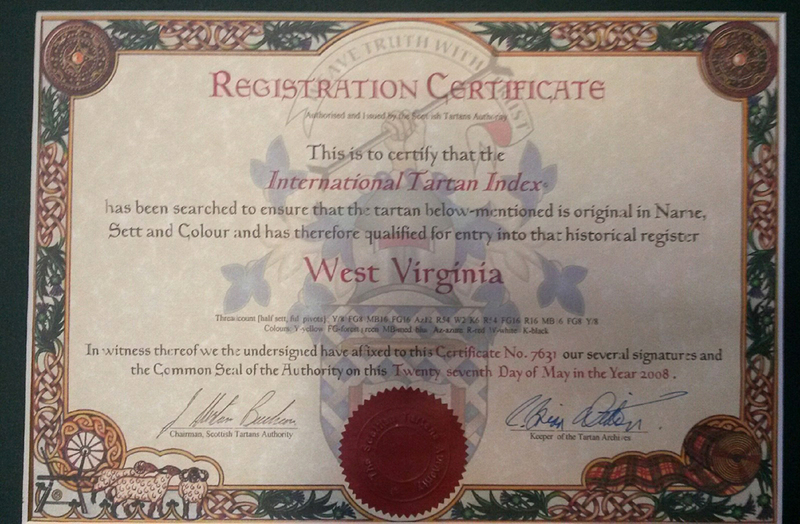 On May 27, 2008, the Official West Virginia State Tartan was recognized by The Scottish Register of Tartans and given the official reference number of 7631. On March 10, 2009, the first products, woven in Scotland by Ingles-Buchan, reached American soil and on April 6, 2009, National Tartan Day, John, Ron, and Kevin presented an Official West Virginia Tartan tie and scarf to then Governor Joseph Manchin. Designating an adaptation of “West Virginia Shawl” as the Official Tartan of the State of West Virginia. Further Resolved, That the Clerk of the House of Delegates forward a certified copy of this resolution to Dr. Philip D. Smith, J. Kevin Grant, Ronald E. Grant and John A. Grant III.